When skylight installations go smoothly, you’ll enjoy warm, natural light while decreasing energy costs. Remember, though, that do-it-yourself skylight projects should be undertaken carefully in order to avoid roof leaks and costly repairs. To achieve calculated energy performance, it’s best to have a local roofing contractor install your skylight. However, if you prefer to install the skylight yourself, be sure to carefully follow manufacturer guidelines and take the following points into consideration. Check the slope of your roof before installing the skylight. Water is less likely to leak into your home if the skylight is properly positioned and water is able to run downhill (and off of your roof). 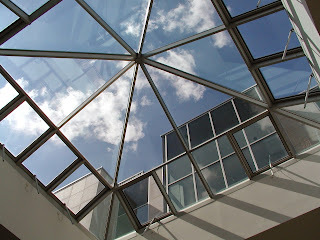 In addition, a properly tilted skylight is more energy efficient. Most skylight manufacturers recommend that homeowners calculate skylight tilt by adding 5 to 15 degrees to their home’s geographical latitude. If you’re installing a skylight that required the building of a “curb” or raised lip, cover the curb tightly with high-quality, waterproof flashing. The skylight manufacturer should carry waterproof metal flashing, but you can also purchase it from a roofing supplier. Spread a layer of waterproof roofing cement around the metal edges. To ensure a tight flashing seal. A putty knife works well for this. The layer should be uniform and approximately ¼- to ½-inch thick. Apply roofing cement or epoxy to the bottom of the shingles as you reattach them around the skylight, and include a layer around the skylight’s perimeter, as well (on the edge of the adjoining shingles). This prevents water from seeping under the shingles. When installing the skylight yourself, you can never be too careful. Consider purchasing a curb seal, which forms an airtight seal around the skylight, flashing and roof. After you’ve installed and sufficiently sealed your skylight, pour a bucket of water over its edges. Position someone inside your home to check for leaks while you observe from the outside. Invest in Proper Installation. Skylight moisture control is hard to achieve, but when your new window to the world is correctly installed—you’ll be thrilled with the results. To request your estimate for skylight installation or leak repairs, contact Trudel and Sons Roofing, your Stouffville-based roofing repair contractor with over three decades of experience. We’re known for our top-notch customer service and fast response times.